Morning Dress. This costume is a petticoat of fawn coloured gros de Naples, with a very broad hem at the border, headed by an embroidery of Pomona-green floize silk, in a Greek pattern. A canezou-spencer of white muslin is worn with it, richly embroidered in stripes formed of satin-stitch raised spots. The body is drawn, but not very full, and a falling-cape collar falls over it, at the throat, of plain India muslin, trimmed round with two rows of lace. The sleeves are à la Mameluke, and immensely wide. They are finished at the wrists by stiffened points, à l’Antique, of cambric; and next the hand are very broad bracelets of gold, clasped by a cameo-head. 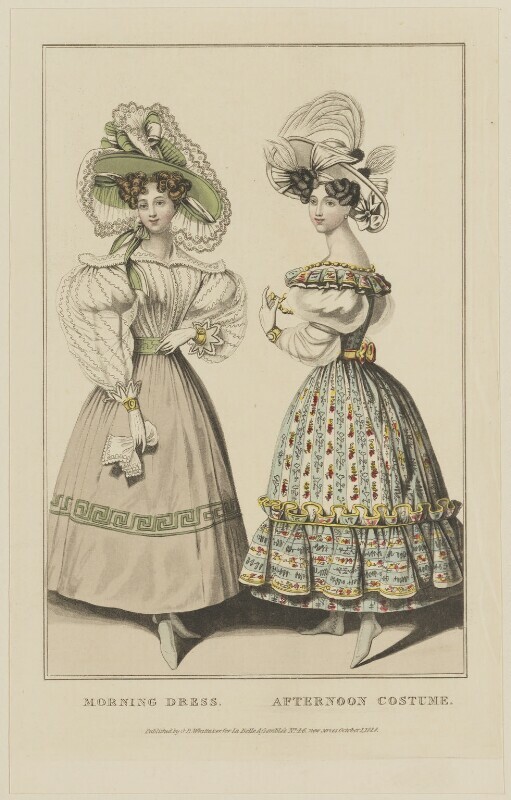 When this dress is adopted for the promenade, a bonnet of Pomona-green gros de Naples is worn with it, with a broad white blond at the edge of the brim. The crown is tastefully ornamented with the same blond, and with small bows of green and white ribbon: the blond at the edge is caught up in front, and from thence appears to be carried up on the crown: the bonnet ties under the chin, on the right side, by ribbon similar to that on the crown. The half-boots are of Pomona-green kid. Afternoon Costume. This is a very favourite style of parure adopted in the country, after returning from the morning walk or drive. It consists of a dress of painted Indian taffety, in white stripes on a ground of pearl-grey. Between the stripes are delicate figures in the most beautiful pencil-work, all of one colour; and on the white stripes, small detached bouquets, remarkable for the variety and splendour of their colours. A very broad, full flounce, with the stripes crosswise, surrounds the border; this flounce is headed en dents de loup, and bound with bright jonquil satin. The body is made quite plain, very much pinched in, and the waist encircled by a yellow ribbon edged with scarlet, with a small rosette behind, without ends. A double frill of the same material as the dress, surrounds the tucker part of the bust. The sleeves are à la Marie, of white crêpe-lisse, and are confined only in the centre of the thickest part of the arm, and at the wrists, by bracelets of very broad gold lace, clasped by a cameo in alto-relievo. The head-dress is a hat of white crape, trimmed with white satin ribbon, the chief ornaments of which are under the brim, in a bow on the left side, and layers. Under the right side is a small white feather; and white esprits, or other fancy plumage, adorn the crown. The ear-rings are of gold. Half-boots, made to fit like a stocking, are of the palest shade of willow-green satin; the fronts are of mignonette-leaf-green, and are of corded or spotted gros de Naples.